The life of Marc Chagall was not an easy one. Nor was it uneventful. It was however, filled with enough drama to delight even the most seasoned and skeptical of Hollywood producers. He perceived the events of World War 1 from afar, saw the hopes and disappointments of the Russian Revolution, barely escaped the onslaught of World War 2, was revered for his artistic prowess, admired by Picasso, and left behind a rich artistic legacy. Oil on canvas, 184 x 148.5 cm. The Royal Collection, The Hague. In effect, Chagall’s life and success was the result of many fortuitous encounters… the first one primarily being the encounter with art at school, which led to his illustrious career path. A meeting later in life would prove to be truly life-changing however. He encountered Hiram Bingham IV when he was living in France, who was able to procure for him an American visa so that he and his family could flee Vichy France, and near-certain deportment to a concentration camp. So, the art world, and in fact, society in general, has a lot to thank Hiram Bingham IV for. 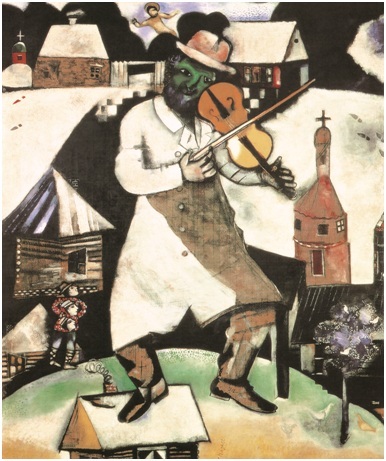 Not only was he responsible for guaranteeing that the life and remaining works of Chagall would be preserved, but he also helped to save the lives of over 2,500 Jewish refugees by ensuring they received visas (against official government policy of the time) to the United States out of Vichy France. The events of World War 2 were to haunt the artist, as his later paintings show. Themes of war and the crucifixion play across several of his post-war works, giving a voice to those who were silenced. We can go so far as to say that whilst Chagall was the one who directly painted the Paris Opera House ceiling, designed the stained glass windows for the Metz Cathedral, and produced countless stunning artworks, Hiram Bingham IV was the one who made it possible. Oil on canvas, 49.4 x 61.8 cm. So whilst we are grateful to Bingham for the brave and heroic decisions that he made, let us take a moment to think of the millions who did not have such a lucky escape. And upon seeing the works done by Chagall, take a moment to think about the masterpieces of art, concertos, ballets, theatre, etc. which the world will never see. In celebrating Chagall, we remember. The Musée de Luxembourg, in Paris, will soon be hosting an exhibition dedicated to the works of Marc Chagall, looking especially at the relationship between war and peace within his art. 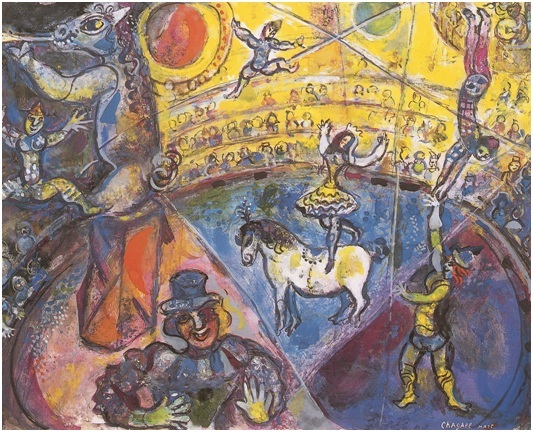 The exhibition, Chagall entre Guerre et Paix will be held between the 21st February and the 21st July 2013. Otherwise, be sure to peruse a copy of Sylvie Forrestier’s Chagall.